CARNOUSTIE, Scotland — The Open is the wildest major: the unpredictable weather, the otherworldly courses, and the sheer nuttiness that sometimes transpires. (Van de Velde will always be the gold standard, of course, but let us not forget Woosie's 15th club, Richard Boxhall breaking his leg mid-swing and various pasty streakers, their junk shriveled in the frigid air.) So let's round-up all that we've learned so far across two utterly intriguing days at the 147th Open. 1. Kevin Kisner is not going anywhere. For 17 holes on Friday, the surprise first-round round leader played beautiful golf, making five birdies and a series of entertaining pars. Yeah, the second shot on 18 was overly ambitious, but that's the Kiz. How fearless is he? At last year's Presidents Cup, barely a month after Tiger's X-rated photo leaked on the Internet, Kisner had the temerity to make jokes about it in the U.S. team room…in front of Woods, who couldn't help but laugh. 2. Brooks Koepka played a bunker shot from his knees and Padraig Harrington took a swing with a leg straddling each side of a boundary fence, but the most unusual shot of the tournament so far was Jason Day playing a left-handed chip. Ah, links golf. 3. Tommy Fleetwood is a bad man. In the local vernacular, he's a flusher, and the purity of his ball-striking allowed him to shoot a bogeyless 65 through heavy rain. It's hard to remember that, when Fleetwood woke up on July 1 last year, he had one career win, and it had come four long years earlier. But he's been on an almighty tear ever since, including three wins, the Race to Dubai crown and his 63 last month to nearly steal the U.S. Open. The one thing Fleetwood, 27, hasn't been able to do is crack the code at the Open, having missed three straight cuts beginning in 2014 and finishing a ho-hum 27th last year. The native of Southport, England, knows the enormity of the opportunity he now faces. “I can't lie about it, if I could pick one tournament in my life to win, it would be the Open,” Fleetwood said with a grin on Friday. “I've never been anywhere near before.” Given the elegance of his long game and wonderful scoring touch, this won't be his last chance, but cashing in this opportunity will put Fleetwood in the conversation with golf's other 20-something studs. 4. The largely starless Thursday leaderboard got a lot more glittery thanks to the fine play of Rory McIlroy, Jordan Spieth, Rickie Fowler and Zach Johnson, among others. But many of golf's biggest names lost the plot on Friday and were sent packing. World No. 1 Dustin Johnson, after a frightful opening 76, was two under through 16 holes but finished bogey-double bogey…a day after tripling the 18th. 5. Beginning on the 3rd hole, Justin Thomas made three consecutive double bogeys and then, after a little rally, bogeyed 16 and 17 to seal his doom. Jon Rahm was three under for the tournament before ending his front nine triple bogey-bogey-double bogey; he doubled 16, too. Sergio Garcia had effectively rallied from an opening 75 until he, too, made double bogey on 16. Bubba Watson bogeyed four holes on the back nine. Ian Poulter, fighting for a spot on the Ryder Cup, made three doubles and shot 81. Carnasty. 6. It's not often you hear Tour pros sound happy that a course is playing longer but heavy rain on Friday morning moved Tiger Woods to say, "The golf course was a little bit softer today, obviously. We were able to control the ball on the ground a little bit easier today, which was nice.” Danny Willett estimated there was three clubs less roll on the fairways. He said, "It's a strange concept when you don't want to go into the fairway bunkers. Clubbing up is a sneaky one to commit your golf shots.” More showers are expected late Friday night but that is the last rain in the forecast, so hopefully by Sunday afternoon Carnoustie will once again be brown sugar. 7. If you attended a cocktail party this week amongst tweedy gents affiliated with the Royal & Ancient it was impossible not to detect buzz about Carnoustie's tenuous place in the Open rota. Substandard attendance in previous playings and an absence of hotels and restaurants in town have led to the notion that this Open is make-or-break for the proud links. Matthew Southgate, who enters the weekend in 18th place, is a Carnoustie member and following the second round he offered a passionate defense of his club. "You go all around the world and say the word 'Carnoustie,' and everyone thinks of golf. No one thinks of a cathedral or a church. This is what it is," he said. "This is the holy grail, as it were, this is up there with St. Andrews, the history and the club and what this golf club has achieved. It's something somebody at this club can be proud of. I wouldn't want to see it leave this golf course and leave this town. I'd be very, very surprised if they didn't play another Open Championship around here. "Everybody's got their opinions, but my opinion of this place, places like St. Georges, without putting any other Open venue down, everybody has a preference. 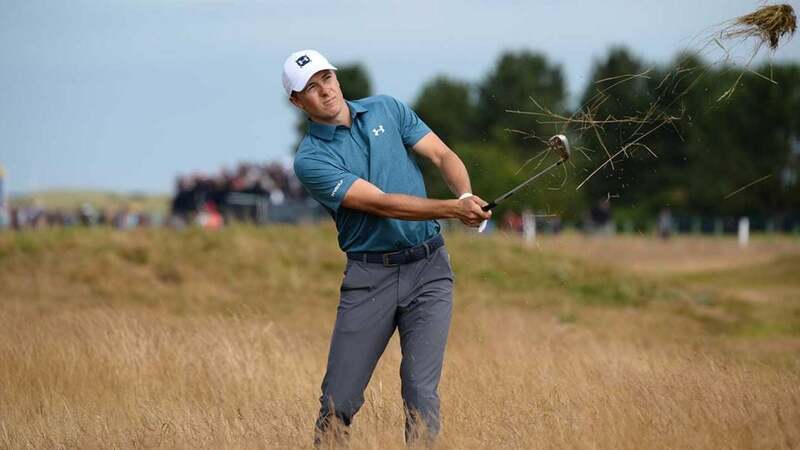 I think certainly the people running the golf club would do whatever it takes to put the course into whatever condition it needs to be to hold the Open Championship. That's not really that hard of work out there. If you want new bunkers or to change the course a bit, you can do that in a couple of months. So I'd be very surprised if they didn't come back.” Here's hoping. 8. No cheering in the press box? Sheee-it. At the Open reporters are unofficially seated by geography – Yanks over here, Aussies over there. Twice on Friday afternoon, corners of the expansive tent erupted — first, the Japanese contingent let out a loud, collective gasp when Hideki Matsuyama lipped out a putt for double bogey(!) on 18, dooming him to a missed cut. Later, when Justin Rose poured in a 20-footer to make the cut on the number, the English beat guys roared as if Harry Kane had netted a PK to win the World Cup. Mind you, this is nothing personal, it's business. While Matsuyama and Rose are agreeable fellows, those in the press room root mostly for stories, not people. So, what are the best stories left on the board for this scrupulously impartial observer? 11. Sung Kang wins, reigniting the juiciest controversy of the year. 10. The most underrated player in golf, Xander Schauffele, finally gets his due…and certifies me as a latter-day Nostradamus since he was my pre-tournament dark horse. 9. The nicest guy in golf, Tony Finau, continues his ascension with a major breakthrough. 8. Zach Johnson punches his ticket to the Hall of Fame. You can't possibly have a more macho major championship haul than Augusta National, the Old Course and Carnoustie. 7. Fleetwood joins the game's front ranks. 6. Perez wins the Open, hijinks ensue. 5. Matt Kuchar, rebounding from his heartbreak at last year's Open, sheds the dreaded title of Best Player Never To Have Won A Major. 4. Spieth goes back-to-back and continues his march on history. 3. Fowler gets his long-anticipated breakthrough. 2. Rory McIlroy reclaims his destiny and wins another major championship. 1. Woods wins his 15th major, completing golf's greatest comeback since Ben Hogan got hit by a bus.